With our 20th wedding anniversary coming up, I decided to write about our love story. 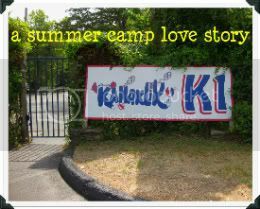 Please join me in the upcoming days as I tell A Summer Camp Love Story. My other camp friend Dawn and I had the most enviable jobs of all the girls' staff at Kanakuk Kamps: We worked in the boys' summer camp office. Oh yes, all day long, our office looked out over the boys' camp. All day long, good-looking college counselors came in and flirted with the only girls they saw every day--the office girls. Did I mention that these college guys were also college athletes? And maybe I should also mention that these college athletes rarely wore shirts. Oh, but being immersed into boy culture was not always what we expected. Most days, those boys were sweaty and dirty. They'd always leave behind their sweaty arm prints on our front counter. They took great delight in not wearing deodorant during those 28 days. Oh yes, we could always smell these boys even before we'd see them. Even so, we felt protective over these boys we mostly treated like brothers. Oh, sure. There were good-looking boys who flirted. But, more than just good-looking, these were good boys, kind boys, funny boys, smart boys, Christian boys with bright futures. That boys' side of camp was a hand-picked gathering of some of the most godly, kid-loving, character-filled group of eligible bachelors any husband-seeking girl could want. Like I said, Dawn and I had the sweetest office girl jobs at the whole camp! And remember the list? Sure, I saw every one of the guys on my list every single day. I interacted with them many times daily as they came into the office. Yes, I saw them in all kinds of situations every day... sweaty, and tired, and energetic, and laughing, and joking, and flirting, and yelling, and lonesome, and always--always looking for mail and packages from home. And Dawn and I were the girls behind the counter. The girls sorting and handing out their mail, answering their phone calls--offering them the necessary connection and encouragement from home. There was one guy in particular, though, that had more work in our office than the others. Or perhaps he pretended to have more work in our office than the others? I saw him every day much more often than I saw the others. Which is really interesting--because he actually lived and worked on the girls' side of camp. Yes, Dave worked on the girls' side, and I worked on the boys' side. And somehow, we met in the middle--literally--and fell in love. See! I wasn't kidding about the shirtless part!